Psalm 51 :7 Wash me with hyssop, then I will be clean. Wash me, then I will be whiter than snow. Hyssop is a small bushy aromatic plant of the mint family, the bitter minty leaves of which are used in cooking and herbal medicine. Bar soap has been around for centuries. Liquid soap was first patented in the 1860’s but didn’t become a mass market item until around the 1970’s. Is one better than the other? Both bar and liquid soap are effective for washing hands and bodies and are available with moisturizers, antibacterial agents, scents, etc. Bar soap is usually packaged in a paper or plastic wrapper and often a cardboard box too. Liquid soap typically comes in a plastic bottle and may have a pump to make dispensing easier. Multi-packs of bar soap or liquid soap are usually wrapped in plastic or packaged in a box. This is where bar soap and liquid soap part ways. Bar soap is small, compact, and lightweight. The first ingredient in liquid soap is water and water is heavy and uses a lot more energy for transportation from the manufacturer to the store. At the end of the life of a bar of soap, there is nothing left or maybe a small sliver to throw away or attach to the next bar of soap. At the end of the life of a bottle of liquid soap, there is an empty plastic bottle. The bottle can be refilled and reused or recycled. When did I buy the first plastic liquid soap bottle or dispenser? I don’t remember but perhaps it all started years ago when I purchased our first bathroom accessory set with matching toothbrush holder, cup, liquid soap dispenser, facial tissue holder, and wastebasket. Who decreed we needed these decorative items in our bathrooms I do not know but I succumbed. Once we started using liquid soap for hand washing it was only a matter of time before it found its way into our showers. When you think about it, transporting water around in the form of liquid soap doesn’t make economic or environmental sense. Both bar and liquid soap often come with unnecessary packaging. And then there are all the plastic dispensers and bottles. Lets go back to bar soap! 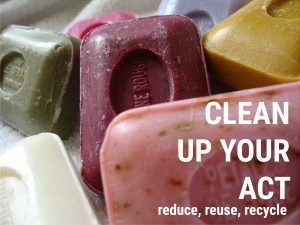 Bar soap is an even more positive environmental product when you can purchase it from a company like LUSH https://www.lush.ca which sells its products in minimal, recycled or no packaging. LUSH also has a great shampoo bar soap product! I am also finding that many local craft markets here in Canada feature homemade soap providers that offer quality products with little to no packaging. There are some bulk liquid providers out there but they are very few and you still have to deal with the bulk plastic containers that the product is transported to the stores in. Maybe it is time to give up on liquid soap. Anyway, bar soap can look good too!